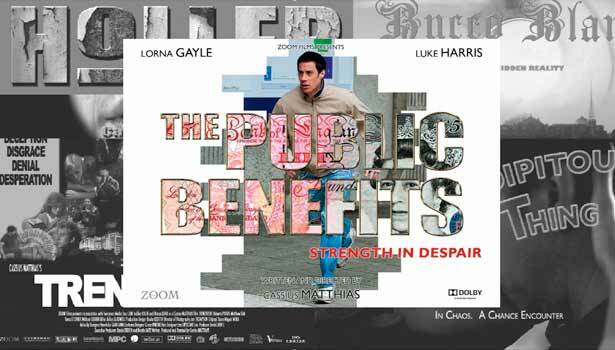 Paranoid and twisted, The Public Benefits reflects the desperation of unemployment, and the dark side of the welfare state and benefits culture. The interviewing process endured by Britain’s unemployed when signing on to claim social security is seen from the point of view of twenty-something playwright Adam Smith, played by Luke Harris. From his point of view, the dole office is seen as a surreal place – a breeding place of anxiety, hopelessness, and fear. When a Customer Service Agent, played by Katharine Dower, is violently attacked by an aggrieved claimant (Gordon Case) and a gunman (Anton Saunders) opens fire, the system cracks and pandemonium reigns. Christopher Adamson (Reader), Charlotte Akenhead (Miss Terchiavelli), Rob Allan (Smoker), Danny Bedford (Skinhead), Gordon Case (Anorak Man), Nicola Clackson (Gypsy/Customer Service Agent [CSA] No. 3), Philippa Cooper (Voice), Linda J. Davies (Mum), Alex Dower (Transvestite CSA), Katharine Dower (Katy), Lorna Gayle (Monica), Trevor Goldstein (Knuckle Slapper), Chloe Graham (Voice), Zaki Gruter (Baby), Luke Harris (Adam Smith), Travis Hickey (Youth in Shorts), Rebekah Hinds (CSA No. 2), Ryan Kiggell (Marcel), Julian Miller (Voice), Nick Piovanelli (CSA No. 4), Anton Saunders (Guy in Fatigues), Matthew Sim (Man in Bowler Hat), Elisa Terren (Woman in Burka/Girl with Blue Hair), Nina Voelker (Voice), Miltos Yerolemou (CSA No. 1), Gary Arthurs (Stunt Coordinator). A Zoom Films presentation. Produced by Cassius Matthias. Executive Producers, Daniel Broch, David James Pitts. Associate Producer, Avy Andrews. Directed by Cassius Matthias. Screenplay, Cassius Matthias. Camera, Peter Butler; editor, Miikka Leskinen; music, Miguel Mera, The Devil; casting director, Reg Poerscout-Edgerton; production designer, Hauke Richter; costume designer, Eleanor Baker; hair & make-up designer, Sue Wyburgh; sound, Gareth John; supervising sound editor, Richard Fordham; sound editors, Stephen Hart, Rob Humpage, Emmet O’Donnell; supervising re-recording sound mixer, Jamie Roden; assistant director, Matthew Hanson; line producer, Andrew Litvin. Complementing Composer, Miguel Mera’s original score the soundtrack features numbers The Throne, Agatha Christie, and My Last Waltz from The Devil’s hotly anticipated forthcoming debut album. “An unusual combination of Indian Sarangi (a bowed string instrument which is said to resemble the sound of the human voice) and electronic resources resulted in a fantastical soundtrack used for a surreal sequence towards the end of the film. The music has thematic relationships with music from the other parts of the trilogy,” Mera says. The 1971 modernist block built onto the King Street side of Hammersmith and Fulham’s original 1930s Town Hall and its bleak concrete plaza were just rght for the introduction to Adam’s journey. After months of scouting, this location was found with the help of the locations department at Film London. Matthias, cast and crew on set rehearsing and shooting the exterior escalator scene, above left and centre. 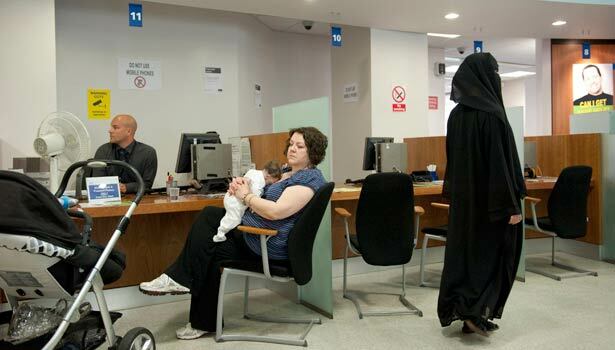 The building’s utilitarian and minimalist interior, above right, with its carefully delineated areas that effectively segregate claimants and staff, its cool, quasi-therapeutic colour scheme and discreet lighting provided interesting visual and staging opportunities for the story’s main action. Above, posters specially created to use as part of the interior dole office set design. In every detail the filmmakers aimed for a genuine yet heightened feeling of authenticity for the setting of the story. Visual special effects where used to enhance the film’s climactic, dream-like chaos episode. “We wanted to get an oneiric feel for the slow mo sequence, so we did a simple re-timing based on a crude optical flow algorithm. This produces visual artefacts similar to those induced by psychedelic drugs, like background dragging and strobing,” says VFX Supervisor MacPhellimey.